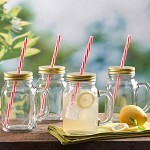 Enjoy a cute and easy solution to your mobile beverage needs with this Gibson Home Decha 4-Piece 19 oz Mason Jar Set! 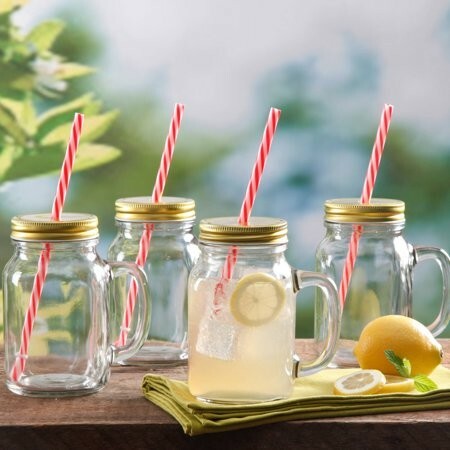 Inspired by the classic look of canning jars, they offer the durability and versatility of those timeless glass storage containers. 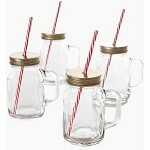 Lids and straws are included to make drinking on the go easier and spill-free. A handle lets you use them for warm or cold beverages with a comfortable grip. The size is just right for a smoothie, a latte or plain, refreshing ice water. They're dishwasher safe for easy and convenient clean-up. A set of 4 gives you enough to serve a small group or family at once. These Mason jars with straws and lids are fantastic for day to day use, and they also can add ambiance to an Americana- or country-themed event!